(CNN) - There's no more if. Chris Christie is running for re-election. New Jersey's Republican governor told local reporters Monday that he was running for a second term, citing a need to carry out his leadership in the aftermath of Superstorm Sandy. "The public needs to know that I'm in this for the long haul, that the person who has helped to lead them through the initial crisis wants to be here to lead them through the rebuilding and restoration of our state," he said at the news conference. "It would be wrong for me to leave now. I don't want to leave now. We have a job to do." He also announced he filed documents to set in motion a bid next year for re-election. The filing of papers allows Christie to set up his campaign, raise re-election funds, and hire staff. While he likely won't make a formal announcement until January, Christie said he made public his decision Monday because people had been asking in recent weeks whether he would stay. "I felt like it just wasn't right to leave that question unanswered. And so, it's answered. I'm running. I'm in this race. I'm in this race to win," he said. "I love this job more than any other job I've had in my life, and I don't see any reason to leave it voluntarily." The news of the Garden State governor's re-election filing comes the same day a poll indicated his approval rating among registered voters in the state at 77%, a twenty-one point spike since late October. The jump in Christie's numbers appeared to stem from his very active response to the superstorm that struck his state late last month, causing severe damage. His rating before the storm was an already-high 56%, according to the Fairleigh Dickinson poll released Monday. Christie saw a similar increase in the number of people who say he's doing an "excellent" or "good" job as governor. Before the storm, 55% held that view. After Sandy, 70% said he was doing an "excellent" or "good" job. The spike in approval for Christie's job performance came largely from Democrats, 26% of whom approved of him before the storm. That rate jumped to 67% afterwards. Christie was a top surrogate for Mitt Romney during the presidential campaign, and was seriously considered as a potential running mate for the GOP nominee. However he came under fire from some Republicans following Romney's loss for his appearance with President Barack Obama in New Jersey during the storm's aftermath, and for his praise of the president and the federal government's assistance to New Jersey immediately after the storm. The news Monday that Christie will launch a re-election bid was widely expected. Much of the electoral guesswork in New Jersey now focuses on which Democrat will challenge Christie next fall, with much of the speculation centered on two-term Newark Mayor Cory Booker, who's seen as a rising star in the Democratic Party. Others considering bids are state Sen. Richard Codey - who served as governor for 14 months following the November 2004 resignation of then–Gov. Jim McGreevey – as well as State Sen. Barbara Buono and Assembly member Lou Greenwald. In a hypothetical 2013 general election matchup, Christie had a slight 46%-42% edge over Booker, according to a Quinnipiac University survey released last month. Newark's Democratic mayor said in mid-November his decision on running for governor has been pushed back because of Sandy, which left a path of destruction in parts of the Garden State – including Newark. "Chris Christie exemplifies the type of results-oriented leadership New Jersey residents expect from their governor," said Louisiana Gov. Bobby Jindal, the new chairman of the Republican Governors Association, in a statement following Christie's announcement. "Thanks to his bold leadership, Governor Christie is well-positioned to secure a second term and continue the progress New Jersey has made since he took office." Democrats see it a different way, and highlight the state's 9.7% unemployment rate. "On the economic front I think he's failed to deliver again and again and again. He's got a huge raft of negatives against him that is sometimes hidden by the rhetoric and theater and side show that is Governor Christie," Colm O'Comartun, executive director of the Democratic Governors Association, told CNN earlier this month. "New Jersey is a state that's brought down big characters before." New Jersey, along with Virginia, are the only two states to hold gubernatorial contests in the year after a presidential election. Because they are the only games in town, they often receive outsized attention. 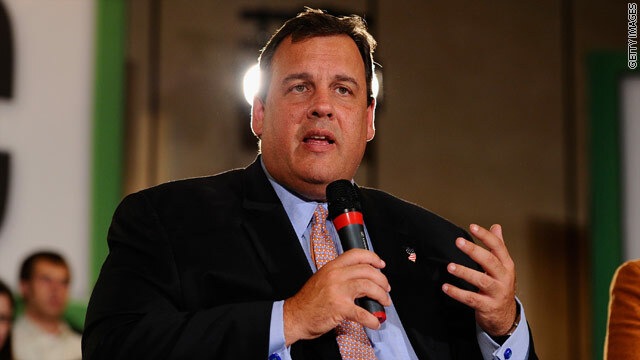 Add in an outspoken and larger-than-life governor, like Christie, who may also be thinking of a possible bid for the 2016 GOP presidential nomination, and it's a safe bet that the political spotlight will shine brightly on New Jersey over the next year. Good luck Chris. The only republican who has bothered to tell the truth about anything lately. Must like his job. I just don't see this country voting for this man if he decides to run for president in 2016.....to fat, It's the last form of discrimination that no one tries to get past. Big obstacle for him to jump over....no pun intended! See what I'm saying? I thank you in advance for answering the call. I've been calling for weeks and my husband calls and he is sent a Serviceman/woman for assistant. I'm open minded but, I am truly Thankful for the Intervention of the Holy Spirit. Talk to you later, I need this work done. Unless New Jersey Dems find a better guy, they better get used to this man in Trenton. Fat bigots abound! Judge a man by the contents of his character,not his lunch bucket!!! Call Christie what you'd like but I'd vote for this guy before I'd ever vote Bush, Gingrinch, Rubio, Ryan or any of those wanna be leaders. Christie is a born leader who represents the people and not those so-called cronies in Washington, I just pray they don't corrupt him. Much respect for how he placed politics aside to help the people affected by the storm.